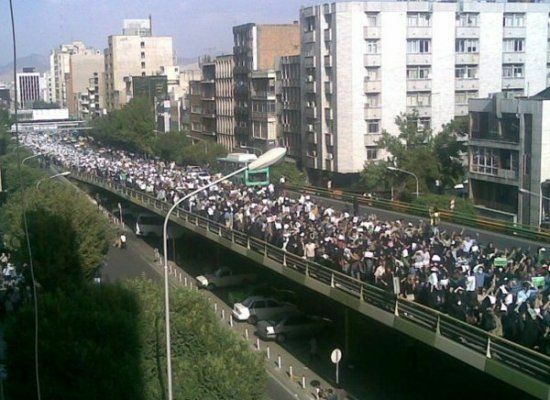 Juan Cristóbal says: – Thousands of citizens march on highways, demanding the elites in power recognize popular will. Students protest against a fraudulent election, the power of a petro-state hanging in the balance. Armed government militias roam the cities freely, attacking civic-minded protesters with total impunity. The streets of the capital stained with the blood of pro-democracy activists. Pardon me for stating the obvious, but Venezuelans have seen this movie before. Hell, we’ve lived it. And there’s no happy ending. What will happen in Iran? Is the Islamic Republic really hanging in the balance? What lessons can we learn from the Venezuelan experience? Sadly, if anything, Venezuela’s experience does not provide much hope for Iran’s Mousavi backers. I’m no Iran expert, but judging by what we’ve gone through, this slow kabuki dance will be long on drama and short on substance. We learned long ago that not to underestimate a petro-dictatorship’s ability to ignore what happens on the streets. Marcha no mata mullah, chamo, y Twitter no mata dictadura. Just ask the Burmese monks. First off, the facts. The government claims Ahmadinejad won in a landslide. The opposition, as well as many foreign journalists and “experts,” believed the election was going to be much closer, with reformist Mousavi gaining significant momentum. But with very few reliable pre-election polls, the only fact out there is the scarcity of facts. Skim the Iran-related articles in the website fivethirtyeight.com and you’ll see that (gasp!) there is already a paper out there “showing” there was fraud by applying la bendita Benford’s Law. What’s the term in farsi for “here we go again“? I don’t really know where the truth lies. The marches in favor of reform have been impressive, but so were Manuel Rosales’ marches before the December 2006 Presidential election, which Chávez won in a Mahmoud-sized margin. It’s easy to forget Iran is a relatively poor petro-state, and we all know what that means: great power (and popularity) for the incumbent, even more so if he’s a populist. We also know that there are no checks and balances, and that Ahmadinejad and his status-quo-lovin’ posse are the types of fellas that will stop at nothing to maintain their grip on power. In fact, a provocative article on Politico.com argues that it’s very likely that Ahmadinejad won the election, that the thousands of middle class Iranian students are not representative of the majority of Iran’s population, and that we should all get over it and move on. The article alleges that the current perception in the West – that Mousavi was robbed – is a product of shallow understanding of Iranian politics and demographics. In other words, Iran-watchers better get their heads out of their escuálido asses, ’cause Iran ain’t Chacao. So while the election was, to paraphrase Christopher Hitchens, a sham, and the Islamic Republic is not a democracy by any meaningful standard, it may also be true that Ahmadinejad’s victory reflects the will of the people. In that scenario, is it healthy to harbor hope that the current events will result in a dramatic shift in power? And what tools do the green masses have at their disposal to effect change? Just like in Venezuela, what happened in Iran could be a combination of fraud and Ahmadinejad being the legitimate winner. Faced with Mousavi’s surge, it is perfectly reasonable for the government to tweak the vote in order to give it a more comfortable margin of victory. If that is the case, this lends legitimacy to both camps’ arguments. Whatever happens in Iran, it’s undeniable that the opposition has shown a force not seen in thirty years, and this could sow the seeds for the future demise of the Islamic Republic. In that scenario, the medium-term effects of the protests may be more important than the likely short-term effects. In that context, there are at least three lessons that Iran holds for us. One is the advantage of having a visible, courageous and, most of all, free leader. If it were not for Mr. Mousavi being free and at large, it’s hard to imagine the current movement going as far as it has. Another lesson is the importance of participating, even when elections have little chance of bringing change about. Had Mr. Mousavi and his backers abstained, they would have no legitimate argument to be out in the streets, and their ability to pressure and make change happen would be even lower than it is now. The other lesson is in the power of alternative media as a way of overcoming official censorship. As we see the last independent TV station in Venezuela gasping for air, it’s easy to think of its demise as the end of the possibility of regime change. But the world is changing, and old media is not the only media out there. The role of alternative media sites such as Facebook or Twitter or (hell, why not) blogs in the current crisis should be carefully analyzed, specially by Venezuela’s hapless opposition. They have yet to take advantage of new networks and XXI-st Century forms of communication. They better learn quickly. ‘Cause pretty soon, they may be the only weapons they have.